With long limbs, long hand and foot fingers, and wing-like membranes for tree-to-tree gliding, Maiopatagium furculiferumand Vilevolodon diplomylos are the oldest known gliders in the long history of early mammals. The new discoveries suggest that the volant, or flying, way of life evolved among mammalian ancestors 100 million years earlier than the first modern mammal fliers. The fossils are described in two papers published this week in Nature by an international team of scientists from the University of Chicago and Beijing Museum of Natural History. “With every new mammal fossil from the Age of Dinosaurs, we continue to be surprised by how diverse mammalian forerunners were in both feeding and locomotor adaptations. The groundwork for mammals’ successful diversification today appears to have been laid long ago,” he said. The ability to glide in the air is one of the many remarkable adaptations in mammals. Most mammals live on land, but volant mammals, including flying squirrels and bats that flap bird-like wings, made an important transition between land and aerial habitats. The ability to glide between trees allowed the ancient animals to find food that was inaccessible to other land animals. That evolutionary advantage can still be seen among today’s mammals such as flying squirrels in North America and Asia, scaly-tailed gliders of Africa, marsupial sugar gliders of Australia and colugos of Southeast Asia. The Jurassic Maiopatagium and Vilevolodon are stem mammaliaforms, long-extinct relatives of living mammals. They are haramiyidans, an entirely extinct branch on the mammalian evolutionary tree, but are considered to be among forerunners to modern mammals. Both fossils show the exquisitely fossilized, wing-like skin membranes between their front and back limbs. They also show many skeletal features in their shoulder joints and forelimbs that gave the ancient animals the agility to be capable gliders. 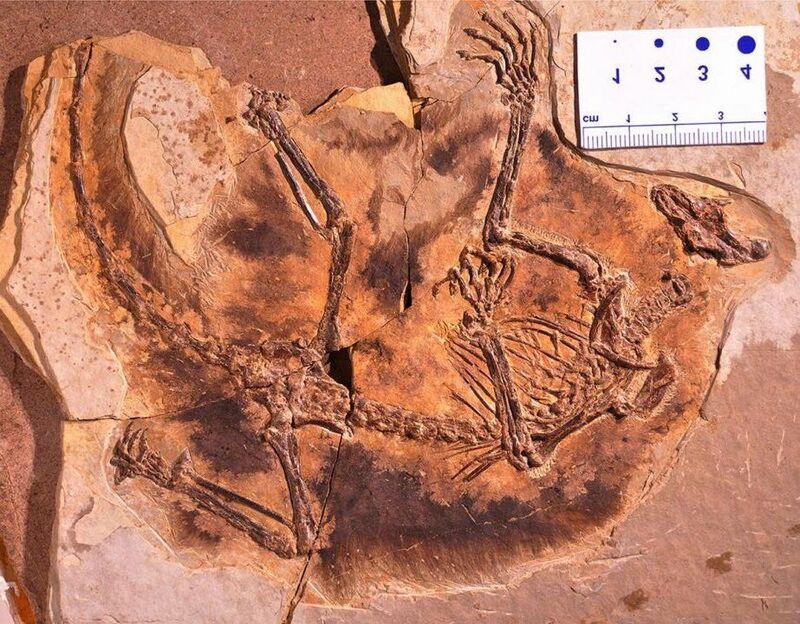 Evolutionarily, the two fossils, discovered in the Tiaojishan Formation northeast of Beijing, China, represent the earliest examples of gliding behavior among extinct mammal ancestors. The two newly discovered creatures also share similar ecology with modern gliders, with some significant differences. Today, the hallmark of most mammal gliders is their herbivorous diet that typically consists of seeds, fruits and other soft parts of flowering plants. But Maiopatagium and Vilevolodon lived in a Jurassic world where the plant life was dominated by ferns and gymnosperm plants like cycads, gingkoes and conifers — long before flowering plants came to dominate in the Cretaceous Period, and their way of life was also associated with feeding on these entirely different plants. This distinct diet and lifestyle evolved again some 100 million years later among modern mammals, in examples of convergent evolution and ecology. Early mammals were once thought to have differences in anatomy from each other, with limited opportunities to inhabit different environments. The new glider fossils from the dinosaur-dominated Jurassic Period, along with numerous other fossils described by Luo and colleagues in the last 10 years, however, provide strong evidence that ancestral mammals adapted to their wide-ranging environments despite competition from dinosaurs.